This has led to suggestions that, in return for building closer relations with Turkey, Moscow might be prepared to do a deal whereby Assad is removed from power and Russia's military interests in the country are safeguarded. The deepening diplomatic pact between Turkey and Russia represents yet another damning indictment of the Obama Administration's ability to maintain relations with Washington's traditional allies in the Middle East. 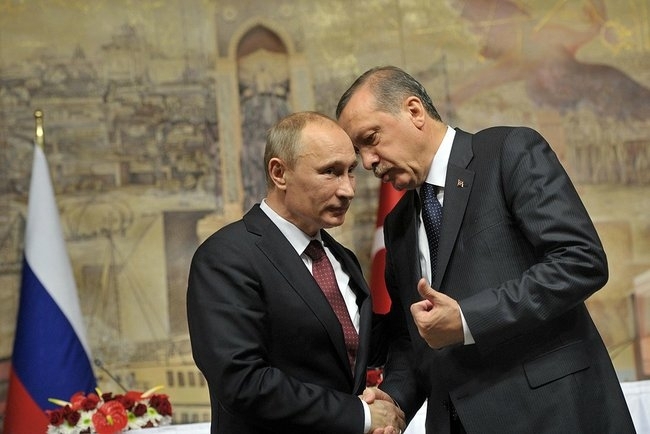 Western diplomats regard the decision by Turkish President Recep Tayyip Erdogan to restore relations with Moscow last month as part of a carefully-coordinated attempt by Ankara to build a new power base in the region. For decades Turkey, a key NATO member, has said that it wants to forge closer ties with the West, to the extent that Turkish diplomats insist that Ankara is still serious about joining the European Union. But the increasingly hard-line Islamist approach taken by Mr Erdogan in the wake of the failed military coup, which has seen tens of thousands of judges, academics and journalists forced from their jobs, has caused the Turkish government to realise the prospects of maintaining relations with its Western allies are remote so long as it continues with the current crack-down. This had led Mr Erdogan to embark on a campaign to reach out to countries such as Russia, which he regards as a viable alternative to the U.S. in protecting Turkey's interests in the region. The Turkish leader's disillusionment with U.S. President Barack Obama predates the tensions caused by the military coup and Turkey's demand that Washington extradites the exiled Turkish cleric Fethullah Gulen, whom Ankara accuses of orchestrating the failed military coup. The fall-out between Mr Erdogan and Mr Obama dates back to the American president's failure to follow up on his threat to launch military action against Syrian President Bashar al-Assad if he used chemical weapons against his own people in Syria's brutal civil war. From the outset of the conflict, Mr Erdogan has been committed to the overthrow of the Assad regime, which is accused of supporting Kurdish separatist groups. It is for this reason that the U.S. has accused Turkey of turning a blind eye to the activities of Islamic State of Iraq and Syria (ISIS) terrorists on its lengthy border with Syria. Indeed, the big stumbling block preventing Turkey from having better relations with Russia was that Moscow was helping to keep the Assad regime in power through the military intervention by Russian forces that began last year. But in recent months the Kremlin has hinted that keeping Assad in power is not its primary concern. Rather its main objective in Syria is to protect its strategically-important military bases in the country. And if that outcome could be achieved, then Turkey and Russia would be able to forge a powerful partnership, one that would pose a serious threat to Western interests in the Middle East and beyond. Mr Coughlin is Defence and Foreign Affairs Editor of London's Daily Telegraph.